A top security prison was locked down for two days following an explosion in a wing, the Prison Service said. 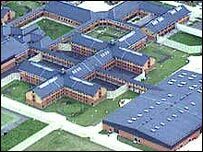 A full search was carried after the firework-like blast within a wing at Whitemoor Prison in Cambridgeshire on the 4 August. It caused no damage to the prison, the Prison Service said. A device is being analysed but "there is nothing to indicate at this stage that explosives had been smuggled into the prison," the spokeswoman added. On Thursday she revealed that there had been a "very small firework-like explosion" in a wing at about 1945 BST. "The prison was locked up for the night on time," read the statement. "The following day the prison was locked down whilst a full search was carried out using specialist staff and detection dogs from the prison service. "Cambridgeshire Police have launched an investigation. There will also be an internal investigation." A Cambridgeshire Police spokeswoman confirmed that they had been asked to investigate. "We can confirm that a matter has been referred to us from HM Prison Services and that an investigation is being conducted." Whitemoor is a maximum security prison for men in Category A and B.